Trada Casino is a modern online casino. Trada Casino players can choose from a wide variety of slots, table games and other casino specialties from Microgaming, Netent, iSoftBet, Evolution Gaming, Playson, WMS and Ainsworth. The site is of course also available on mobile devices. Trada Casino is available in English only, provides live support from nine o’clock in the morning until eleven o’clock at night and is licensed by the UKGC. This casino is found to be reliable by the CasinoKings Club team. 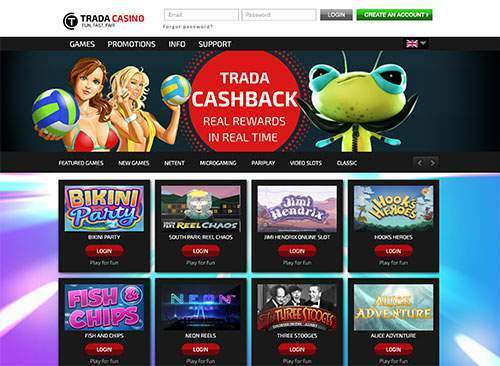 Trada has a great welcome bonus: 25 Great Rhino Bonus Spins on sign up (no deposit!) and a whopping 100 Great Rhino Bonus Spins!. Make your first deposit at TradaCasino with a minimum of $/€/£ 10 today and get rewarded with 100 Bonus Spins on Great Rhino by Pragmatic Play! In addition, Trada has set up their so called Adventure Calendar where they announce a new bonus every day: free spins, free super spins, deposit bonuses, the list goes on and on. Usually, a deposit of only 20 euros is enough to pick up these bonuses. So this is a calendar you want to keep an eye on! As with all bonuses terms and conditions apply. Make sure you read them before you accept a bonus. Slot lovers are well catered for with a good variety of both bonus video slots and classic slot machines. These include titles of both Microgaming and Pariplay, including popular favorites such as Immortal Romance, Rainbow Riches, Wild Wild West, Dead or Alive, Rabbit in the Hat, Raging Rhino and many more top games. Trada Casino also has an exceptional selection of bingo, keno, scratch cards, and specialty games from both Microgaming and Pariplay. Bingo players can choose from different varieties of this game as Mayan Bingo, Super Bonus Bingo and Bingo Samba. Lovers of scratch cards can try their luck with games like Whack a Jackpot, Slam Funk and Turtley Awesome. Different arcade games are also available. Table Game enthusiasts can choose from several roulette and blackjack variants at Trada Casino, including Classic Blackjack, Spanish Blackjack, Vegas Strip Blackjack, American Roulette, Premier Roulette Diamond and French Roulette. Furthermore, this casino also offers Cyber Stud Poker, Baccarat Gold and Casino War. Trada Casino’s selection of video poker Microgaming is extensive with many games offered in both single hand and multi-hand versions. Available variants include Aces & Faces, Double Double Bonus, Double Louisiana, Deuces Wild, Tens or Better, Joker Poker and Jacks or Better. Trada Casino has a useful live chat service available for you between nine o’clock in the morning and eleven o’clock at night. The chat is always available right away, but outside the daily hours, ​you get a quick response via email, which of course is also fine. Usually, ​you have a response within 24 hours. All Trada Casino web pages are encrypted using industry standard 128-bit SSL Comodo, a leading security company. This technology is the same protocol used amongst banks to keep private information confidential. As such, players can rest assured that their information is safe. As part of the UKGC licensing requirements, Trada Casino allows routinely check of its games by independent bodies TST and iTech Labs. These checks are done to show that all games are truly random at Trada Casino. This is what you would expect from a casino on the site of casinokings.club. Afghanistan, Algeria, American Samoa, Australia, Belgium, Cayman Islands, Cyprus, Denmark, France, French Guiana, French Polynesia, French Southern Territories, Iran, Iraq, Israel, Italy, Japan, Laos, Libya, Martinique, Nigeria, North Korea, Pakistan, Poland, Saint Pierre and Miquelon, Saudi Arabia, Singapore, South Korea, Sudan, Tunisia, Turkey, United States, Vatican City, Yemen. Trada casino carries our reward of excellence seal that is only awarded to online casinos that meet our standards with an average of 8/10 or higher. With this seal we also state that Trada is a fully trustworthy casino with a good service for its players. My favorite casino. I’ve been playing at this casino for over a year now and it is very good. The bonuses are good and what I like is that you can lock your withdrawals. This has already saved my wins a couple of times because I can’t start playing with it until it has been cashed out. Trada is my new favorite casino. I played at Rizk quite a bit, but I tend to choose for Trada more often. They have a great cashback program and additional bonuses. And always quick and friendly service. Trada Casino, now they know how to treat you right! The withdrawal time is really fast and I simply have not encountered such a good casino in a long time with kind people and good service. Trada Casino is by far the best online casino I have ever played at and I’ve been gambling online a good 10 years now. It’s no wonder these guys won the best customer service award last year. Verification was done in a timely manner. Withdrawals were done even faster. Definitely in my top 5!